Is my love birthday on 02 April. Interestingly I do not think I have make a birthday cake for him for the years we have celebrate together. Reason is , he does not seem to fancy any cream cake, not that he is picky , I might have influence him that we always prefer light and fluffy cake. To ask him what is his favourite cake is another pain . Almost to him everything is great. I guess for a novice baker , I am not good in create just from anything . Is better to have an core ingredients to look out for or even some flavor one prefer. After an argument , I give up and decided a cake I want to bake for him. I guess this will set the precedence for his birthday cake now onwards ^__*. I chose Durian Mousse Cream Cake. Is so blessed to be able to find Malaysia frozen durian here. Which is pack in the packet.Though we have durian fruit that is frozen here but is mostly product of Thailand. I still prefer Malaysia durian. 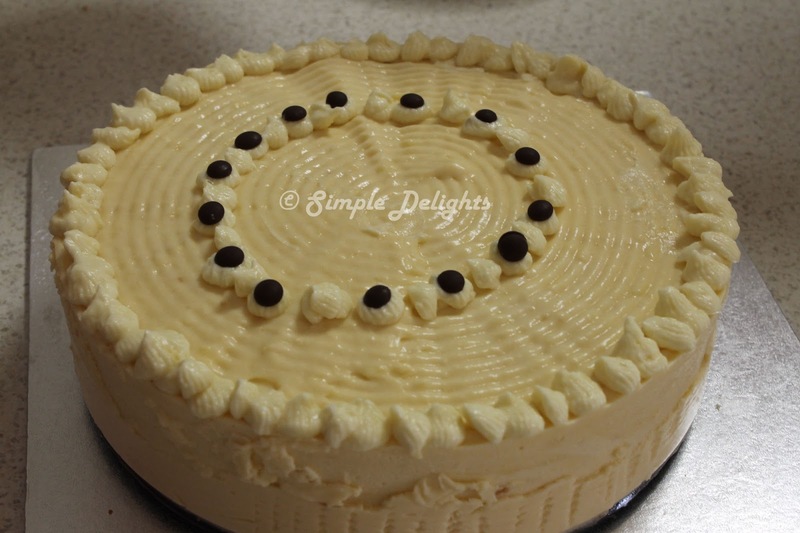 It is such an excitement to bake this cake , not only it has been a long time we have durian but also the cake does not use any durian essence is just pure fragrant from the fruit itself. 1. Preheat oven to 160 degrees C.
4. Fold in shifted flour by hand using spatula with an upward circulating motion. 5. Take some of the mixture mixed with the melted butter in a bowl, once well mixed pour into the batter and combine well until batter is shiny. 7. Once bake let it cool for awhile and take it out put on the rack to cool further. 3. In a sauce pan, warm the milk with sugar until the sugar completely dissolved. In a large bowl, mixed the egg yolks then gradually pour the warm milk to the yolks mixed well. Mix in the durian flesh until well combine. 4. Add in the gelatin into the durian mixture and make sure all the gelatin combine well into the durian mixture. Leave it aside to cool down. 5. Take the metal bowl out and whipped the cream till soft peak. 6 Fold in whipped fresh cream into the durian mixture whisk well to combine by using a hand whisk.The durian mousse cream is ready to be used. 2.Cover with another layer of cake. Press the cake down a bit as it will tend to float up. Then spread remaining mousse. 3. Leave cake in the fridge to set. The egg yolks does help to make the cream yellowish which is close with durian flesh color . Love this cake , as we have another couple join in the celebration , which the husband birthday is just few days apart. They both enjoy every bite of the cake. Simply love the durian mousse cream. 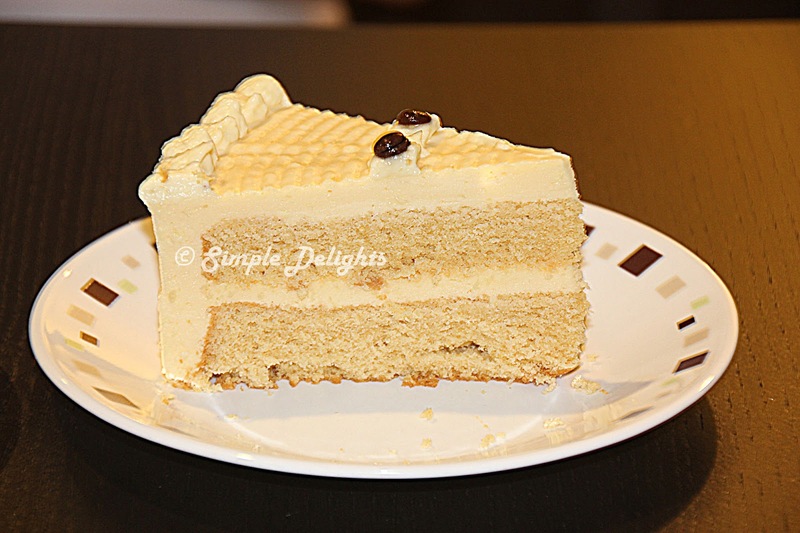 Is rich and creamy , as I used brown sugar in the sponge cake it looks brownish compare to white yellow sponge cake. However I do find the sponge cake is a bit on a heavy texture is not as light and fluffy as the sponge cake would be. Surely will bake this cake again, might try different type of sponge cake recipe then. If you are durian lover , definitely must try this and enjoy the fullest of this beautiful fruit.